Virginia & Truckee coach No. 9 was built by the Kimball Manufacturing Company of San Francisco in 1873 at a cost of $1,900. Like the earlier coach No. 8 and later coach No. 15, No. 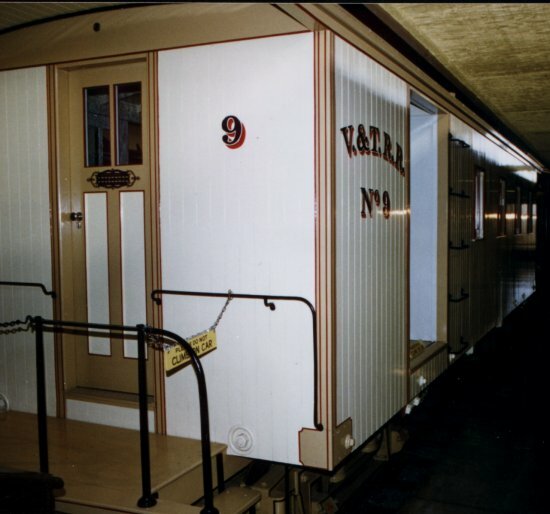 9 worked in caboose and third class passenger service at the end of freight trains. Sometime between 1875 and 1890 the car was modified by removing the side doors and its passenger compartment was extended through the former baggage compartment, making it a simple coach, or miner's car. The car continued in regular use on freight trains until the downturn in Comstock mine business in the 1890s. After that it was only used occasionally. Coach No. 9 was converted to V&T maintenance of way sleeper No. 9 April 25 1908 with the addition of a small clestory. 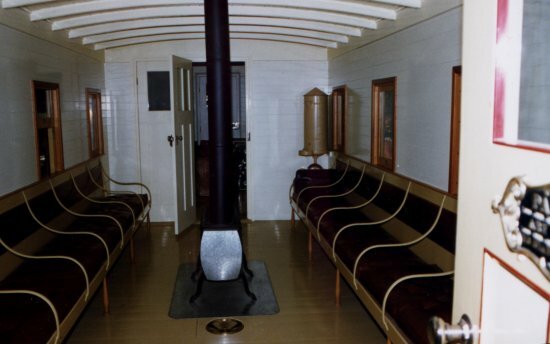 In 1913, the car was converted again, this time to a traditional caboose with the addition of a cupola. In 1938 No. 9 began a new career when Paramount Pictures purchased it for $200 for Cecil B. DeMille's epic Union Pacific. The movie studio removed the cupola. Used for occasional movies after that, No. 9 was finally purchased by the State of Nevada December 8 1971, and in 1982/83 was carefully restored to its 1873 appearance. No. 9 operated in 1986 at Steam Expo in British Columbia, and is currently on display at the Nevada State Railroad Museum.